Today we caught 2 out of 4 big key largo tarpon fishing in the backcountry of the Florida Keys. Dead mullet on the bottom did the trick. We saw plenty of rolling happy fish in the backcountry channels, with the end of the falling tide they were in ‘feed mode’. These fish often bite much better than local fish later into the morning – the water is dirtier, less boats fish for them, and they are fresh wild in from the gulf. 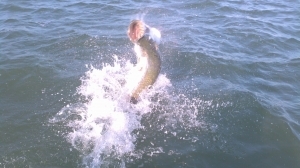 The april key largo tarpon fishing should continue to improve as more migrating fish show up. I have some evenings available through April and May though most every day is booked as my customers book ‘prime’ dates months in advance. If your interested in a fishing charter in key largo than give me a ring, I’d be more than happy to take you or refer you to a professional, courteous guide that I work with!